Baltimore Field Station's Quin Holifield talks to students about soils on the Gwynns Falls Trail. Mary Hardcastle, Baltimore City Department of Recreation and Parks. Snapshot : President Obama’s Every Kid in a Park initiative strives to get every fourth-grader (and his or her family) out on to public lands and waters to connect to nature, play, and learn. The Forest Service’s Northern Research Station teamed up with Northeastern Area State and Private Forestry and Region 9 of the National Forest System to provide a coordinated approach to Every Kid in a Park in the eastern and midwestern states, including events in 10 of our largest urban centers. Our urban approaches to Every Kid in a Park are as varied as the cities themselves. In Philadelphia, Minneapolis, Boston, Chicago, and Cincinnati, Canoemobile events connect kids and families to urban waterways where they learn about the interrelationships of watersheds, forests, and city environments. A growing network of partners and Cincinnati Public Schools created the first Play Outside and Explore event in partnership with the Wayne National Forest. In Baltimore, Forest Service scientists partnered with the Baltimore City Department of Recreation and Parks to take more than 900 students out to Winans Meadow on the Gwynns Falls Trail, part of the National Baltimore Heritage Area. At Winans, students see four different ecosystems: forest, wetland, meadow, and stream, while also learning about the area’s cultural heritage. 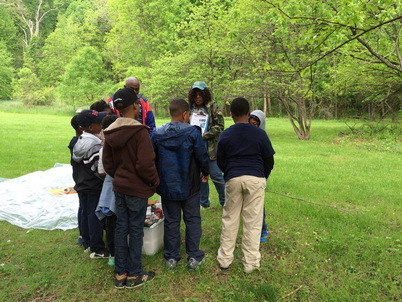 This program, which drew students from six city schools during the school year and 14 recreation centers through the summer, was delivered by staff at the Carrie Murray Nature Center with support from Forest Service staff at the Baltimore Field Station. Baltimore’s Every Kid in a Park programming is expanding this school year through an additional partnership with the National Park Service.